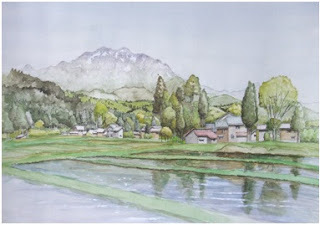 I’d like to show some of the paintings of Mr. Mitsunari Hasegawa, an ordinary business person and engineering graduate who is also a talented artist. He excels at realistic penciled renderings as well as oil and water paitings. He often holds one-man exhibitions and displays his works at many local galleries, but he belongs to no artistic societies. For your viewing pleasure, I present his paintings of Mt. Awagatake, as viewed from Shimagawara, Mt. Sumon, and Mt. Hakkaisan. He painted them all earlier this year. It was only a few years ago that the great sculptor, Ishikawa Uncho (1814-1883), rose to national prominence. Now he is called the Michelangelo of Echigo (Echigo is a former name of Niigata Prefecture). Last Saturday, I was fortunate enough to have an opportunity to join in a tour to see some of his greatest works displayed at Honjoji Temple, the Head Temple of the Hokke Sect located in Sanjo City. Many of his masterpieces are possessed by some of other notable temples and shrines across Echigo. Uncho, as he is usually called, was born in Zoshigaya, Edo (now Tokyo). However, his great artisanal skills were well known and he accepted an invitation by Sanjo’s Uchiyama Matazo to come to Echigo. Further cementing his relationship to the area, he was later adopted at the age of 32 into the Sakai family, one of the more prominent families of Sanjo City at that time. However, it is often said by locals that the real reason he moved to Sanjo is that it sufficiently provided him with “good sake and chisels for life.” All of Niigata Prefecture is known for the quality sake produced within its environs while Sanjo is famous for hardware and ironmongery. It is also reported that he worked only when he was in the mood and felt that the tools were of sufficient quality. According to a pamphlet provided by the temple: Unless he was happy, he never touched his chisels. The pamphlet also noted that he only used a single piece of wood for each of his creations, yet each piece has many layers often carved deep into the wood. According to critics, his works are both bold in style and filled with delicate details. Honjoji Temple’s exhibition contains several of Uncho’s masterpieces. Among many, I was especially impressed by his carvings of animals and the ornate carvings of gods, animals and mythical creatures he did on the temple’s transoms (a transverse beams or bars in the frame of the entrance to the temple), which were created out of single pieces of wood. The animal sculptures shown below are a monkey, a turtle, and an ox. They look so real that I expected them to move and run away at any moment! Also, you can find such animals as elephants, lions, carp, and dragons on the transoms. As well, Uncho’s carvings are observable on some of the existing gates and pavilions still in use today. I had an opportunity to visit “The Dr. Morohashi Tetsuji Museum,” also called “Kangaku No Sato” (Home of Chinese Studies) in Niwatsuki, Shitada Village (which recently merged into Sanjo City). Dr. Morohashi Tetsuji (1883-1982) is best known as Chief Editor of “Dai Kan-Wa Jiten,” the world’s most comprehensive dictionary of Kanji (a 13-volume set with more than 50,000 character entries and 530,000 compound words), published by Taishukan Publishing Co., Ltd. The Sanjoites are proud of Dr. Morohashi, who became a laureate of the Order of Culture in 1965, and the Grand Cordon of the Order of the Sacred Treasure in 1976, for his unprecedentedly great dictionaries and contributions to Japanese language studies, sinology and lexicography. He was, as a professor of several universities and, later, as the President of Tsuru University, well-known for offering lecturers on his work to the Imperial family, and for helping to choose the names of Imperial princes and princesses. I visited the museum because they held a special seminar on Dr. Morohasi and, much to my delight, even showed a DVD-recorded speech by his son, Mr. Morohashi Shinroku, a well-noted former president of Mitsubishi Corporation. The speech, given in 2009 at a Sanjo public hall, was about his father. He also told of how, at the age of 63 in 1945, his father became discouraged when many of the typesets for his great dictionary were destroyed during a bombing raid on Tokyo during the World War just before it was to have been published. However, he proved himself to be very resilient, and soon resumed working on compiling the dictionary. As luck would have it, part of the galley was found undamaged in another location, but it still took him another 15 years, when he became 73 years old, to publish the first part of the dictionary in 1955. The last part was published in 1960 when he was 78. He often came back to his home in the summer months because he so loved Mt. Yagigahana and the people in the village. I still remember how, on one hot summer day, my elementary school classmate and I chased the large black cars that carried him to his small house he kept there, and watched the people entering the house. A thin old man got out of the car, came toward us and said, “What school do you attend?” We shouted “Morisho!” (Morimachi Elementary School), and ran away from his place. I work at Niigata University of Management in Kamo City, a neighboring city of Sanjo City. Kamo’s artisans are famous for being the number one producers of chests of drawers made of paulownia wood. Whenever Japanese people hear the word paulownia wood, “kiri” in Japanese, they think of the chest of drawers called “kiri dansu.” In Japan, it was a common practice for brides to bring one of these pieces of furniture to her groom’s house when they get married as part of her dowry or bridal trousseau. Japanese people used to say, “When you have a baby girl, you should plant a paulownia tree in your garden. Then a furniture maker can produce a kiri dansu out of the tree.” Nowadays, though, it is so expensive to buy one that few people can afford to carry on the tradition. We met the president, Yohsuke Ishiyama, who kindly explained to us about the characteristics of paulownia. Among many virtues, he mentioned that it is environmentally friendly, light, insulative, dry, stable, and sustainable. He also noted that it is physically warm to the touch and helps to create a “spiritually warm, calm and forgiving atmosphere.” It’s capacity to retain the warmth of the tree, in my opinion, is the single best feature of paulownia wood, so I bought a cushion like chair made of paulownia wood. It feels warm when you sit on it. Also, I enjoy using a paulownia mouse pad in my office and a chopping board in my kitchen. Mr. Ishiyama, however, stressed his concept of the “forgiving” nature of the wood. He said the combination of its soft resiliency and the rounded corners crafted by his master woodworkers create a safe environment for children and the elderly. As a Sanjoite, I'm proud of Sanjo City. Please visit the Official City of Sanjo English website and enjoy watching and learning about my city!